Camping along Highway 1 is one of the best road trip destinations in California. There are few places as scenic as the Central Coast. The Pacific Coast Highway's roadside attractions include pristine beaches, wild and rugged coastline and the best oceanfront camping in California. Take your time and explore while Central Coast camping because around every corner is another spectacular landscape and an outdoor adventure waiting to unfold. There are wineries to visit, beaches to comb, and towns to visit. There are sights to see, photographs to be taken and there are many beach campgrounds that will provide a portal for your Central Coast escape. Pack up and head to one of our favorite campgrounds in California's Central Coast. From the surfer's favorite beach campground at El Capitan in Santa Barbara to the beachfront campsites on the sand at Pismo Beach's North Beach Campground, and the ocean view camping at the Kirk Creek Campground in Big Sur you won't be disappointed. There is so much to see and do in California's Central Coast that the only trouble is having enough time to see and do it all. A few regional highlights include wine tasting at Talley Vineyards in Arroyo Grande and Cayucos Cellars in Cayucos, a hot springs soak at the Sycamore Mineral Springs Resort in Avila Beach, and whale watching with Sub Sea Tours in Morro Bay. The adventure seekers will love the zip lining at Ancient Peaks Winery's Margarita Adventures in Santa Margarita, mountain biking or hiking the trails in Montana de Oro State Park or stand up paddle boarding with Central Coast SUP. The Santa Barbara area is one of the most popular destinations for beach camping in California and there are a lot of campsites with unparalleled ocean views. Just twelve miles south of Santa Barbara is Carpenteria State Beach Campground. This is a popular spot for Southern California weekend campers. The one-mile long sandy beach is great for swimming and is patrolled by lifeguards year-round. There are tent campsites, RV and trailer sites as well as group campsites. Refugio and El Capitan State Beach Campgrounds are among the most popular in the region; reservations are highly recommended in the busy summer months. The El Capitan Beach Trail is a six-mile roundtrip walking path that connects the two state beaches and offers scenic vistas and wildlife viewing. El Capitan is a favorite camping destination for surfers and is a great beach for walking, swimming, and fishing. There is a stairway that provides access from the bluffs to the beach area and there are 133 campsites at El Capitan State Beach Campground including tent, group, and RV sites, though the RV dump station is closed. Refugio is an excellent beach for camping, coastal fishing, and exploring tide pools at the mouth of Refugio Canyon. The state beach has day-use picnic areas and lifeguard-led kayak tours during the summer months. There are 66 tent and group campsites at Refugio State Beach; there are no hook-ups. Sites 34, 35, 36, and 61 are beachfront and offer the best ocean views. The sandy beachfront campground at Jalama Beach Park might be the best beach camping anywhere. Located just north of Point Conception, near Lompoc, it is a county-maintained park and has a store and restaurant area. Jalama is popular with windsurfers, surfers and beachcombers. And Jalama isn't just for humans, Fido loves it here too since he's allowed the beach! To get one of the coveted beachfront sites, 53-64, you'll have to arrive midweek or patiently wait for a site to vacate; only group sites are available by reservation. There are also yurts and cabins for rent and an RV dump station. Pismo State Beach has two popular campgrounds: North Beach and Oceano. The area is popular for off-road vehicle recreation, hiking, surfing, and fishing. A nature trail connects the two campgrounds and dogs are allowed on-leash at Pismo State Beach. The North Beach Campground is one of the nicest campgrounds on the coast and is only a short jaunt to the sandy beach. The grassy lawns are nice for pitching a tent and most sites are spacious enough for an RV or trailer. The grounds are well maintained and hot water showers are especially nice after a day at the beach. Sites 11, 14, 24 and 25 have the closest beach access, but if the winds are strong, head to the 52-75 loop for a more protected campsite. Further south, the Oceano Campground is better situated for RVs and trailers and campsites are open to year-round reservations. Montaña de Oro State Park is another fantastic camping destination. It is a favorite among outdoors enthusiasts and there are a variety of camping options at Montaña de Oro. The park offers environmental campsites, which are hike-in sites, that requires about ten to twenty minutes walking to reach. Although Fido loves to hike as much as you do, dogs are not allowed at environmental sites or on any trails within the state park. There are also five horse camps, which do allow dogs. Environmental and horse campsites can be reserved year-round. The Islay Creek Campground is Montaña de Oro's main camping area. The campground is rustic with pit toilets, water faucets, and standard sites. But what the campground lacks in amenities, it makes up for in solitude and natural surroundings. Each campsite in first loop, 1-22, has spectacular ocean views and all campsites are in close proximity to hiking, biking and horse trails, and the ranger station. The nearby Spooner Cove is a sandy beach near the campground where dogs are allowed to walk on-leash. The campground at Morro Bay State Park is located between the lagoon and golf course and is within walking distance of Morro Bay's Embarcadero. The area's most prominent feature, Morro Rock is visible from most areas of the campground. There are 28 RV sites with hook-ups and a total of 126 campsites with restrooms and showers. A bird sanctuary and habitat is nearby and there are plenty of opportunities for outdoor recreation. Located north of Morro Bay and south of Cayucos, Morro Strand State Beach Campground is classic beachfront camping with three-miles of state beach and coastal frontage campsites. This is a more exposed area and can be windy. There are 76 standard campsites, restroom facilities, but no showers or hook-ups. The area is visited by wind and kite surfers, sunbathers and beachcombers. The Hearst San Simeon State Park and nature preserve is one of the oldest units in the California State Parks System. There are two campgrounds in the park, located two miles south of Cambria. The San Simeon Creek Campground has 115 campsites for tent and RV camping. The campground is located near the San Simeon Nature Trail, which has ranger-led interpretive walks during busy summer months. The Washburn Campground is located one mile inland on a bluff overlooking the Santa Lucia Mountains. The camping is primitive with flush toilets and water spigots. Big Sur is a stunning region in the Central Coast located south of Carmel and north of Cambria. The Los Padres National Forest spans a large portion of the area and there are nine state parks. 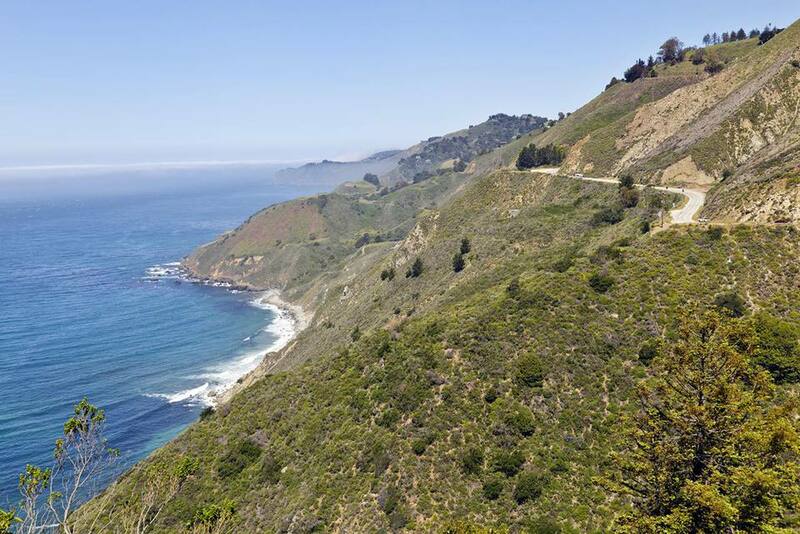 Big Sur's natural beauty truly is spectacular and makes it an extremely popular camping destination. The Plaskett Creek Campground is nestled in a Monterrey pine forest and is situated just east of Highway 1. The Los Padres National Forest campground is in an ideal location and only a short walk away from the nearby Sand Dollar Beach and Jade Cove, top beach destinations in the Central Coast. The campsites at Plaskett Creek are spacious and many sites have ocean vista views. The campground accepts reservations for most sites, but also offers first-come-first-served campsites. Site 21 has the best ocean view and the closest beach access. Sites 35 and 23 are most private and shaded. The campground is favored by local surfers and is very popular on weekends year-round. The best ocean view camping in Big Sur is located at the Kirk Creek Campground. Also located in the Los Padres National Forest, the campground is situated on a bluff overlooking the ocean and rugged coastline. Sites 9 and 10 are most popular for their unobstructed oceanfront location, but all campsites have ocean views and are in close proximity to hiking trails. Directly across the highway from the campground is the Vicente Flats Trailhead, which leads into the Ventana Wilderness. Further north in the Big Sur region are state park campgrounds and a few private campgrounds located on the Big Sur River and in the Santa Lucia Mountains. There are just 24 campsites at Limekiln State Park, which is nestled in the Limekiln River canyon on the east side of the Pacific Coast Highway. Julia Pfeiffer Burns and Andrew Molera State Parks both have walk-in and environmental campsites, but no car camping or dogs are allowed at either of these parks. Andrew Molera walk-in campsites are first-come, first-served. A drive through the Central Coast isn't complete without a stop at a few of the many excellent wineries in the region. The coastal area is known mostly for its pinot noirs and chardonnays. Stop by and taste the wines or buy a bottle to take back to your campsite at Talley Vineyards in Arroyo Grande and Cayucos Cellars in Cayucos. If you prefer to combine your wine tasting with adventure, check out Ancient Peaks Winery's Margarita Adventures. You'll see the Santa Margarita Ranch, learn about agriculture, take a zipline tour, and finish with a wine tasting. The region's most famous historical landmark is Hearst Castle, located in San Simeon about 40 miles north of San Luis Obispo. The mansion was designed for the American newspaper publisher, William Randolph Hearst, and was donated to the California State Park system in 1957. It is now a national historic landmark and tours operate daily. Another fascinating historic landmark is the Point Sur Lighthouse in Big Sur. The lighthouse was established in 1889 and still operates from the rocky headland today. Guided walking tours of the lighthouse operate on Wednesdays and weekends year-round. There are plenty of hot springs in the region. Favorite soaking pools are located at Sycamore Mineral Springs Resort in Avila Beach, Esalen Institute in Big Sur, and Sykes Hot Springs in the Ventana Wilderness. Whether you love hiking, mountain biking or horseback riding, the best trails in the region are found at Montaña de Oro State Park. Highlights include the Bluffs Trail, Valencia Peak Trail, and Hazard Mountain Trail. A beach camping road trip has to include beachcombing. Top Central Coast beaches are located at Spooner Cove in Montaña de Oro State Park and Sand Dollar Beach in Big Sur. Both beaches are dog-friendly on-leash. If your pooch prefers to run free, head to Dog Beach. It is located about between Morro Bay and Cayucos; take the Yerba Buena exit from the Pacific Coast Highway. Sea life is abundant in Morro Bay and the best viewing is from a boat. If you go Whale Watching with Sub Sea Tours in Morro Bay you'll likely see harbor seals, sea otters, and sea lions; you'll get a chance to see California Grey Whales and Monterey Humpback Whales; and if you're lucky you'll also see short-beaked common dolphins. Getting on the water in Morro Bay is a must and there are a few ways to do it. You can take a lesson or rent a stand-up paddleboard from Central Coast SUP or go on a naturalist-guided kayak tour with Central Coast Outdoors. The McWay Falls at Julia Pfeiffer Burns State Park is one of the more popular destinations and sights to see in the Big Sur area. McWay Creek plunges 80-feet over granite cliffs into the Pacific Ocean, creating the most scenic waterfall on the coast. Avoid hefty fines and stay safe by adhering to caution signs in the viewing areas. Big Sur has more to offer than just scenic beaches and rugged coastline. Head up into the Santa Lucia Mountains for a different perspective and climate. The Ventana Wilderness and Los Padres National Forest have trout streams, hiking trails, backcountry camping and epic views of the coast.